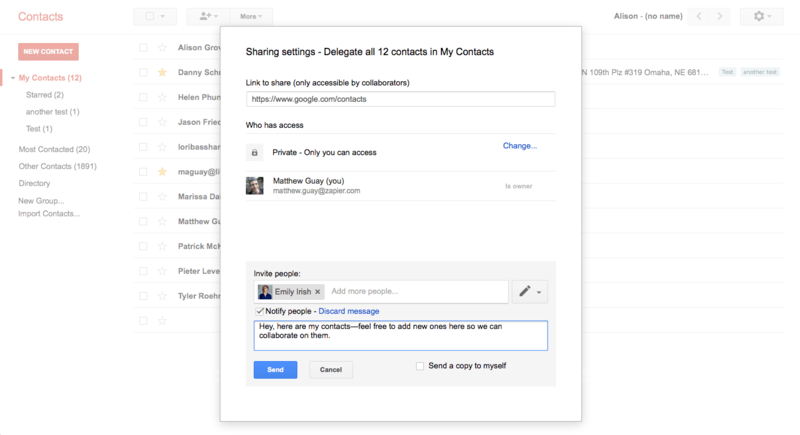 You can't automatically share Google Contacts with everyone—but you can share them manually. You'll want your entire team to be able to stay in touch with each other easily. G Suite's Google Contacts makes that easy by automatically sharing all company contact info with everyone else in the team. Just open Google Contacts—and for now, select the Go to the old version option to get the sharing features. There, select the Directory group in the left menu, and you can see company members' names, emails, and other shared contact info. Want to save a contact to your own contact lists? Just select them and add them to the group you want. By default, G Suite's Google Contacts will add every team member to the directory, showing their email address and domain profiles. In G Suite's Google Contacts settings, you can choose to hide contact info if you want. Or you can enable Domain Shared Contacts—and that's how you can you can share other contacts such as supplier and vendor contacts with your entire company. The only catch is it takes a bit of work.